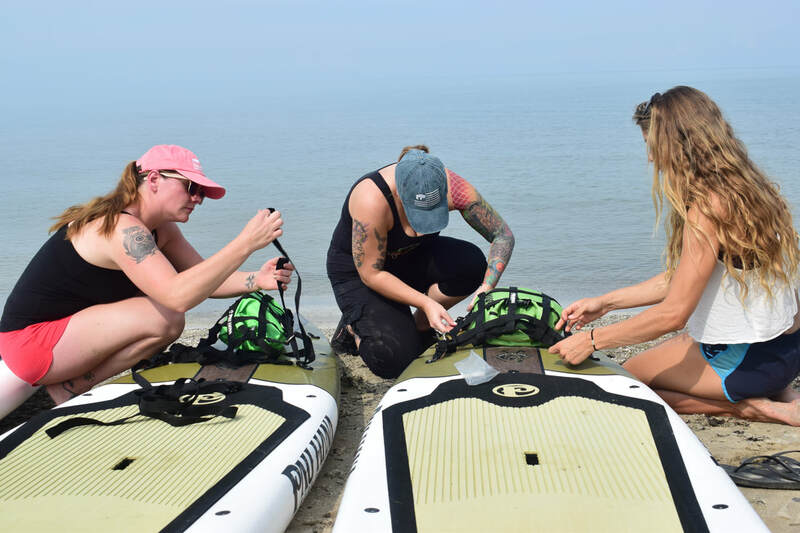 This week I invited my good friends Liz, Denise and Rebecca down for a fun overnight girls paddle-board trip from Eagle Bay to Hanford Bay about 45 minutes south of Buffalo. With all this warm September weather we wanted to get on the water for as long as possible. I picked this paddle because of the beautiful sea cliffs that line the shores of Lake Erie and the easy put in at Eagle bay and take out at my house in Hanford. 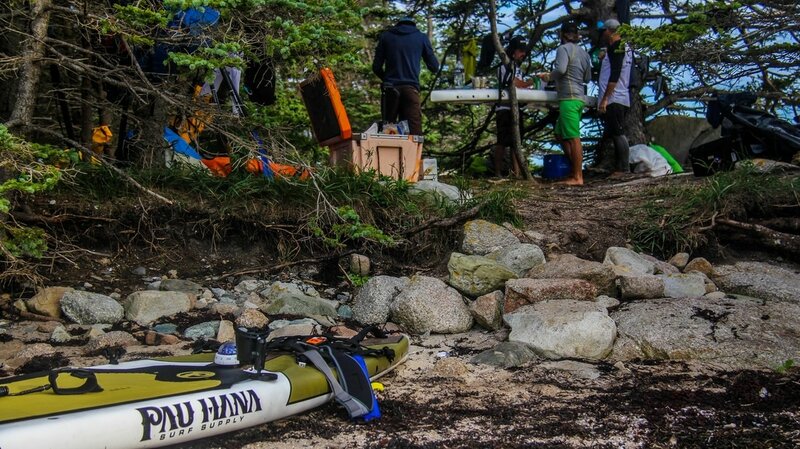 We used the Pau Hana Surf Supply Endurance Boards and Big EZ Richochetes for the durability and easy rigging system to carry all our gear. And I gave my light weight Kialoa Paddles to the girls to try them out. We packed everything we needed for the day and night into our Sealline Dry Bags. The paddle was incredible we spotted Eagles, schools of fish and lots of cool coves. We found a nice place to rest and eat some cheese and crackers on the way to camp and even jumped in the 70 degree lake to cool off! When the sun was beginning to set we looked for a beach to set up camp. We found a great spot and set up our four person Kelty Tent. We enjoyed some rice, beans avocado, and sweet potato wraps for dinner. But my favorite part of the night was sipping wine with the girls and roasting marshmallows over the fire and making smores! The sunset was beautiful and the company was even better! Can't wait to do it again! People have been surfing on the Great Lakes since the early 1950's. But I had no idea until my boyfriend at the time Kevin came home and told me about some guy named Carl he met surfing at Hamburg Beach outside of Buffalo, NY during a snow storm. Kevin had just spent 6 weeks in Maui and learned to surf while over there. The next big wind day he grabbed his wetsuit and shortboard and headed to the spot he saw Carl surfing at and jumped in. The waves were not very good and I thought he looked foolish trying to catch these tiny waves on such a tiny board. With no success I told him he did a good job and was trying really hard. Later in the week Carl called us and asked if we wanted to go surf with him. When I first met Carl he seemed really cool and I thought this guy should be living in California. I told Carl I had never surfed before but I'd always wanted to after watching Blue Crush. He let me borrow a homemade longboard and we paddled out into Lake Erie. It was so awkward trying to find my balance on the surfboard. The next thing I new I was laying down looking toward shore as he began to tell me to paddle and then pushed me into my first wave. I popped up right away and could not believe that I was surfing! I was hooked from there! I bought a 9'0 longboard for Kevin and I from some fellow lake surfers. Every time we would see strong winds coming from the SouthWest we would head up to Pleasant Beach, Canada on Point Abino. It might be the best wave spot on Lake Erie because it has the most fetch on a SW or WSW wind and the point is very exposed. The paddle out in big winds is rough and there is no break between sets. You just have to take a few on the head before you get out and line up your next wave. ​ As Kevin and I were starting to progress in our surfing skills we started to want smaller boards so we could duck dive easier in the bigger waves. Carl started a Great Lake Surf Board Shaping Company called Honu Surf Co. Your not as buoyant in fresh water as you are in saltwater so his boards are perfect for catching fresh water waves. With his help we got to design a board! He made us a wide 7'4 Fun Board with a lot of rocker. It paddles out fast and I feel like I could literally catch any wave on that board! Our surf season really begins in the Fall. The winds pick up and we start to get some bigger waves on the lake. Thats when owning a wetsuit really comes in handy and extends your surf season! Wetsuit Wearhouse has great deals on wetsuits especially if you buy out of season. My go to is a Roxy 4/3 mm I can pretty much wear it any time. Ive worn it in the summer and also during a blizzard. A 5mm is nice for the deep winters though. Kevin and I Surfed the November Blizzard back in 2014 and we saw 10 foot waves on the Lake! It was wild - we were surfing close to each other but couldn't s even see where the other one was. Kevin got lost somewhere down the beach after he got out of the water in the blizzard and finally found his way home. The video we made went viral and we made it on to CNN Headline news you can see the video and interview below. 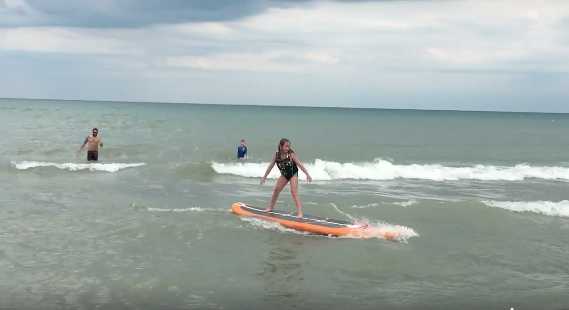 Learning to surf on the Lake was challenging because not only are you dealing with constant waves coming in with not very many breaks, your always moving because of the strong currents so you have to fight to be in the right spot to catch the wave. Your battling harsh conditions strong winds and fridgid temps that take your breath away. When I first traveled to Maui Hawaii I was so excited to get on Ocean Waves. I was in awe the first time I saw the south side of Maui's break at Launiupoko. It was so glassy and the waves looked so perfect. My paddle out was unbelievable, I literally paddled around where the waves were breaking to get to the outside of where the sets were coming. It was so easy. I lined up in the perfect spot and saw a perfect wave coming right towards me. I turned around started paddling and felt the liftoff! As I came down the face of the wave I started to carve my board back up the face and turn back to make another drop! I had never done that before as I started to do it again I thought " I can't believe I can surf like this!" Because I was always battling harsh conditions I never felt like I had time on the wave to try these maneuvers. I was always just trying to hang on. Now that I learned how to carve on such a glassy fun wave I can do it on Lake waves now. Not as smooth as in Hawaii but its possible! I wanted more of a challenging wave so we headed to the North shore of Maui to Hookipa. I never had to battle it out with another person to catch a wave before. The Lake waves were always open and If you caught a party wave with someone else you were happy about it. So I was extremely timid at Hookipa and would always back off to let someone else catch the wave. I learned you had to be aggressive to surf that spot. And although its an incredible wave I really don't like the battle. I would much rather find a wave I can chill at with all my friends and cheer them on as I say "this ones all yours buddy!" 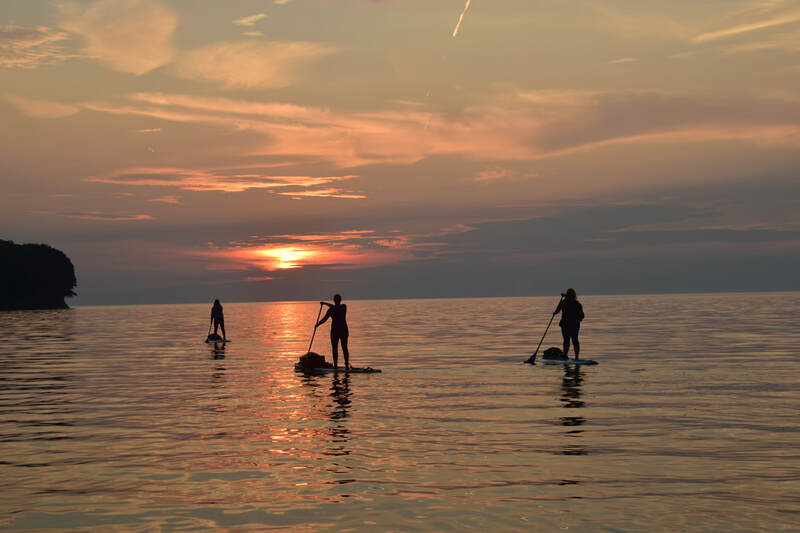 On the Great Lakes there are so many surf spots to check out! If your looking to get into Surfing on the Great Lakes there is a great event for women called Lake Surfista September 9th! Check it out! Now my favorite thing to do is share this incredible sport with others at home and any time I travel. I get that same feeling of stoke, helping someone catch their first wave and make that drop as when I catch a wave. If your interested in learning to surf on Lake Erie we'd love to here from you! 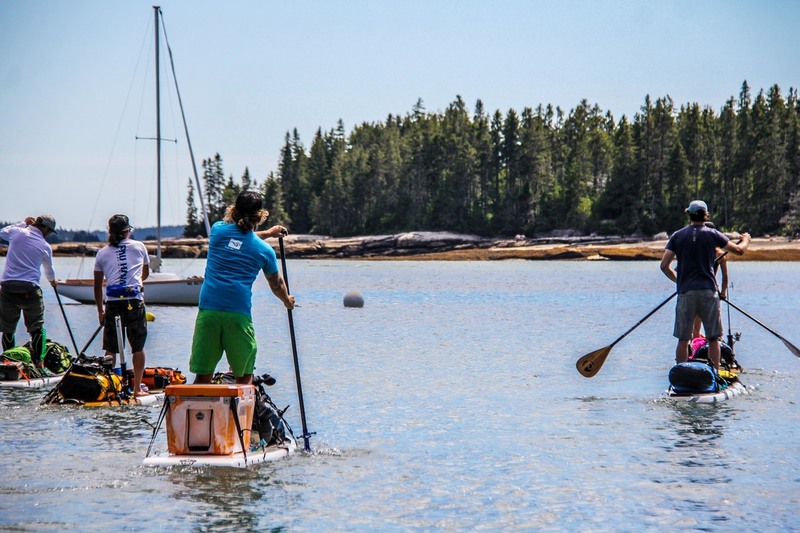 ​I’ve always wanted to go to Maine so when I got the phone call from Todd the owner of Pau Hana Surf Supply about doing a multi-day paddling trip through the Maine Island Trail I knew I couldn’t miss it! He was telling me about the new Endurance touring board he had made for 2017 that is built to hold 90lbs of gear and still glide smoothly in the rough currents and chop. He even designed the deck pad to be a sleeping platform that accommodates a bivy sack! The board sounded awesome and I couldn’t wait to test it out! Driving up to Maine with the Pau Hana Crew the scenery was spectacular. The rocky coastlines, 12 foot tides and giant pines immediately had me feeling like I was on a rugged adventure. On our way to base camp at the southern tip of Deer Isle we stopped at a lobster pound shack and enjoyed some of the best seafood I’ve ever had. 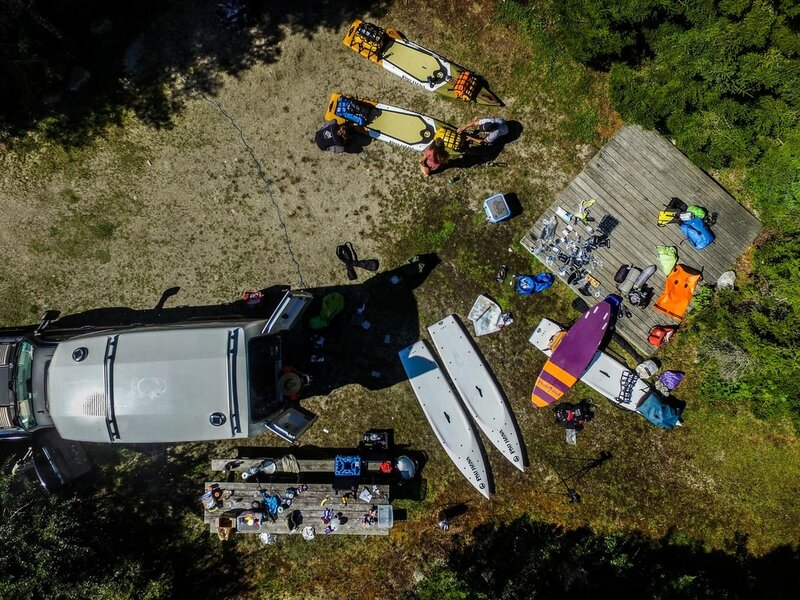 The next morning we loaded up our boards with gear to test out how much weight these boards could hold. We brought along our Kialoa Insanity Paddles for their perfect combination of high performance, lightweight and durability. We each needed to bring a gallon of water per day so 3 gallons total on each board, along with food, cookware, sleeping gear, fishing gear, maps, compass, Russian mules, and camera equipment in our sealline dry bags. Stepping on the board I was surprised how stable it was. 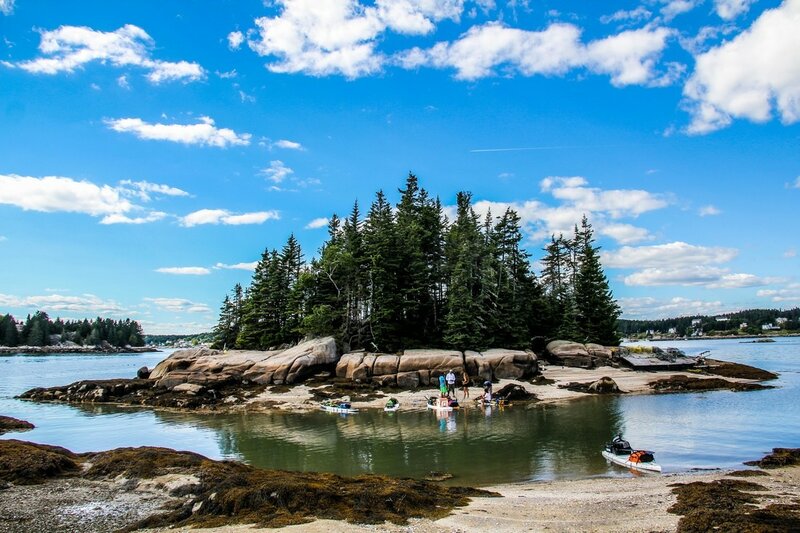 We started paddling toward Green Island Quarry where we heard of a scenic hike and fresh water swim. Todd was the lead navigator with his sweet nautical compass mounted to the board. As we passed a few kayakers and boaters everyone seemed to be in awe of five people paddling on stand-up boards with all that gear. Everyone we met said we got lucky with the weather. It was sunny with a slight breeze pushing us toward our destination. We passed thousands of lobster crates and weaved in and out of multiple islands. When we reached Green Island we had to anchor our boards along the granite cliffs and climb up a steep wooden ladder to get to the trail head. The hike was green and lush and felt like a fairy land. When we got to the Quarry I went for a swim it was so tranquil and refreshing after a few hours of paddling. We then headed toward Steve Island, our camp for the night, and on the way I was trolling for some dinner but had no luck. Around sunset we reached Steve Island and beached our boards. We found the perfect camp site and started to cook dinner and enjoy some Russian Mules. Todd turned one of the boards into a table/cutting board. He designed the boards with a Ricochet technology which made it extremely durable, enough to slice an onion on. Since we didn’t catch any fish it was rice and beans for dinner. I set up my eno hammock and watched the stars. None of us had ever seen the stars so clear and bright. The next morning it was low tide and the beach we had last night was now 100 yards out covered in seaweed boulders. In the small tidal pools were loads of mussels. I started hunting immediately and Todd started boiling white wine and garlic. I never liked mussels until that day. There is something about catching your own food that makes it taste so much better! Our next destination was Isle au Haut. Everyone told us it was an extremely long paddle but we were all up for the challenge. Before we headed out we wanted to eat a good lunch to fuel us up. Todd made an earthen oven under a large rock and we made pizza. The wind started to pick up and the tide was beginning to change. Not ideal paddling conditions for this long paddle but we took off anyways. We were paddling against the wind and tide but made it to Isle au Haut in a few hours. The channel to get to town was beautiful with granite cliffs, a lighthouse and some really cool coastal homes. We explored for a bit before hopping back on our boards to return to Steve’s Island luckily with the wind at our back. It was a chilly night with high winds. 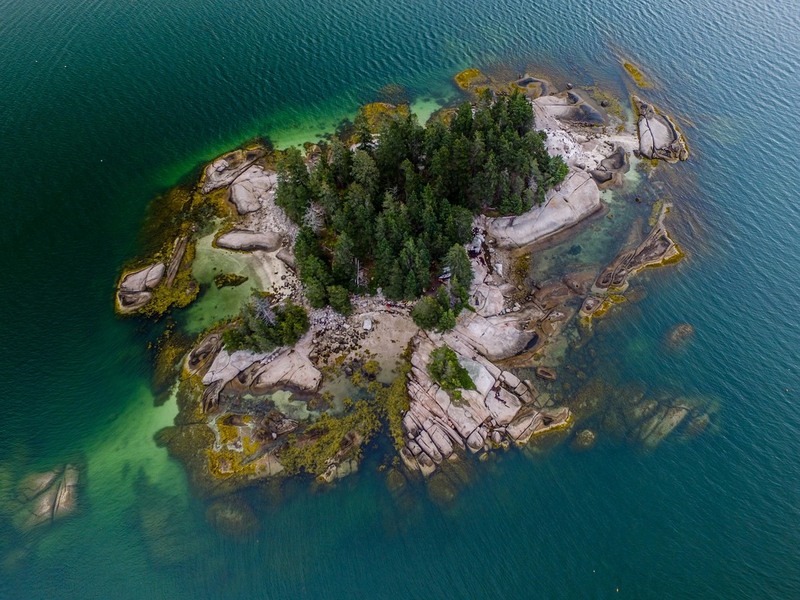 I found a space on the south side of the island where I was protected from the winds and got a decent night’s rest before the long paddle back to Deer Isle the next day. The last day of the trip we had 16 knot winds gusting 20. It was an extremely difficult paddle back and we were all tested at the end. Trying to reach our base camp was so hard. You physically couldn’t stop paddling for a second or you would over shoot your destination point. The winds were pushing so hard I wasn’t sure if we were going to be able to make the take out. Once I saw it I paddled my hardest across a channel but behind me one of the guys capsized and I wanted to make sure he was ok. Luckily he was wearing his Kokatat Centurion life vest and had a leash on. He was able to tip his board back over and get back on. With the strong currents and high wind, by the time he was on his board the wind had pushed us so far back I knew we were going to miss the takeout. We paddled across the channel until we finally reached the granite cliffs on the other side. The closer we got to the cliffs the more shelter we had from the wind and we were able to paddle up wind a bit to make it back to the take out! I felt so good after the challenge I couldn’t wait to reward myself with some fish and chips and lobster rolls! Multi-day paddling trips are now my favorite. I love the feeling of having everything you need to survive right there with you as you paddle along with new scenery around every corner. It’s such a freeing feeling. I can’t wait for the next one. Kevin and Christian are two athletes that love to travel. Follow their adventures as they explore the diverse places and activities they encounter around Western New York and beyond.